America is a land of immigrants. According to historians, even the Native Americans first arrived over the land bridge that originally connected Siberia and Alaska. African-Americans arrived on the slave ships and Europeans arrived mostly during the 19th and early 20th centuries. The Europeans came for many different reasons, but all came of their own volition and wanted the chance to build a better life in a new country. Tracing their arrival is a big step in establishing a major anchor point in your family history. Obviously, for genealogy purposes it helps if you know when and where they arrived in the U.S. That narrows the parameters of your search, and there are plenty of U.S. immigration records you can research for your family history. But even if your information is very limited, you can still try and find the names you want on passenger lists. During the 19th and early 20th centuries, five ports - New York, Boston, Baltimore, Philadelphia and New Orleans - handled most of the immigrant traffic, with New York by far the biggest. Of course, people arrived in any number of other places, but statistically these are your best bets when you begin looking for genealogy clues to your ancestry in U.S. immigration records. But what do you do if you have no idea where you ancestors landed? Some of them would have followed the same established routes as many others and you can use that logic to attempt to narrow your genealogy search. Many who settled along the Mississippi and the Missouri rivers for instance, came in via New Orleans and simply travelled up-river. Settlers in some of the Midwestern states just went directly overland from Baltimore. The Erie Canal was a conduit from New York to the northern states, whilst those in New England would almost certainly have arrived in Boston. It's not foolproof, but at least it offers a starting point for your research into your family history. More immigrants came through New York than any other port, and they have good U.S. immigration records, one of the most invaluable tools for anyone involved in genealogy in the U.S. But if your ancestors arrived in New York after 1892, you should check the records at Ellis Island (whilst it was being constructed, a barge was used for processing immigrants; during 1891, the year the barge was in use, some 405,000 immigrants, about 80% of the U.S. total, were processed there). Ellis Island records are free to access. In some cases, the names listed aren't the ones people had when they left home. There are misspellings and sometimes they were Anglicised, so a person arrived with a new identity. 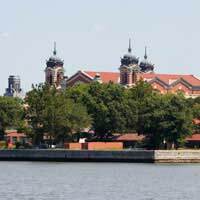 In its first five years, Ellis Island processed 1.5 million immigrants. A total of 17 million people passed through Ellis Island before it closed in 1954. You can access the records on the www.ellisisland.org website. For anyone researching family history in the U.S. it's a vital stop. There are a number of commercial genealogy sites that offer access to passenger lists from several ports. Ancestry.com has many from the main five, plus San Francisco, as well as other, smaller ports. Additionally, they offer some naturalisation records, although in every case, you'll need to pay. Genealogy.com claims to be able to give you online access to "22 million records from more than 25 different databases," a very impressive figure. Their records include information on immigrants from several European countries and Russia, along with passenger indexes from 1820-1850 for the five main ports. Again, it requires payment. Another excellent source are the Filby books, also know as the Passenger and Immigration Lists Index, or PILI. Many libraries have them, or they're available on CD-Rom (or by subscription to Ancestry.com). In them you can find indexes of passenger arrivals and naturalisation. For anyone interested in genealogy and family history, there's plenty to go at in U.S. immigration records once you know where to look.